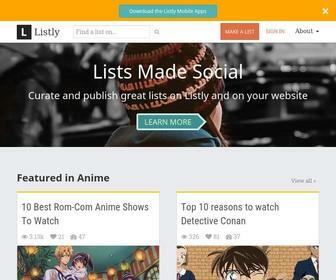 Lists Made Social - Top 10 lists authored by the Listly community of bloggers and publishers. Make cool lists and fun listicles on Listly, share them on Facebook and Twitter, and embed them on your blog or website. Where are List.ly website's visitors located? From the map below, you will know that most of the visitors to this site are from India, there are about 11,946 visitors per day. Which subdomains visitors often go on List.ly? From the chart below, you will know that the subdomain media-cdn.list.ly is very popular, there are about 1,317 visitors per day. Which search keywords send traffic to List.ly website? From the chart below, you will know that there are a lot of visitors to this site by searching the keyword "old hindi songs list", about 91 visitors per day. Where is List.ly website's server located? This site has 8 servers, one of the servers is located in Ashburn, United States. Here we know the reputation of List.ly through several ways. From the chart below, we know that the safety status of the site is caution. From Mar 8, 2012 till now, we detected 13 times on List.ly website. we found that the average Google pagerank is 5. Recently the site was detected on Nov 16, 2015, the Google pagerank is 5. From Mar 8, 2012 till now, we detected 12 times on List.ly website. we found that when you open the site would take an average of about 2.139 seconds to load completely. Recently the site was detected on Feb 6, 2017, it took 2.386 seconds. From Jun 7, 2013 till now, we detected 11 times on List.ly website. we found that this site has an average of 6,405 backlinks. Recently the site was detected on Feb 6, 2017, there are about 6,068 backlinks were found. What websites link to List.ly? The websites below are linking to List.ly. What websites are similar to List.ly website? The websites below are similar to it. This is the domain name information about List.ly. With this information, you will know that it has been registered for 8 years, will expire on 21 Oct 2019, was registered on the website nic.ly, etc.